Usually, shipped within 24-48 hours. Please allow a few days for delivery. 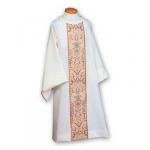 Your item(s) will be drop shipped directly to you from the vestment maker/supplier who ships by UPS or FedEx Ground in the continental USA. 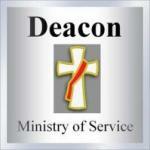 Should faster service or international service be needed, call us for expedited or international shipping rates. Please note that our shopping cart gives several shipping rates for UPS or FedEx. 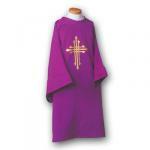 All vestments are for the average sized man, give or take a little. Most dalmatics are amply cut 60" wide and 48" long. 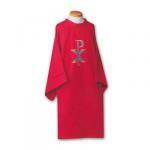 Some deacon stoles are washable except as noted - to dry clean. 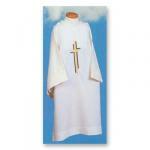 Most are made of wrinkle-free polyester fabrics. Stole size is approximately 53 inches long by 5 inches wide for the average height man, give or take a little. Ample enough for the slightly portly. 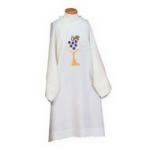 The design is on the front only for deacon stoles and on both sides for the priest stoles. 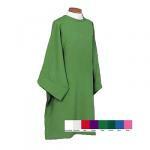 Most come in a variety of liturgical colors Colors hues may vary with each maker/supplier and from photo. Please note: Beau Veste embroidered items are final sales. 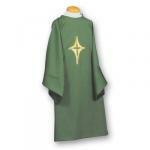 Harbro and RF Toomey stock vestments are exchangeable. Custom orders are final.